Introducing the 20 unique things to do in Siem Reap! From the temples to meaningful travel experiences worth a shot, the Backstreet Academy Team brings you the best of impact travel. Think stone carving workshop with an Angkor restoration artisan, Insect cooking classes with a street food vendors and rice farming with local farmers. Unique, memorable and impactful, all at the same time. Your Backstreet hosts are locals who used to be in poverty, now trained by Backstreet Academy as micro-entrepreneurs, and they make up to 2-3 times their usual income by hosting travelers like you, showcase their tradition and heritage while doing what they love. Check out our pick of the best unique things to do in Siem Reap! The Angkor complex needs little introduction as one of the world’s most well-known UNESCO World heritage site. Boasting well over 1,000km2 of archaeological grounds, you can take up to a week to fully discover all of its treasures and millennia old stories. Most tourists generally take a 1 or 3 day tour before they are fully templed out with the throngs of tourists visiting everyday. If you’re one of them check out our Things to do in Siem Reap besides temples for some non-temple entertainment! Within the Angkor complex are tons of smaller temples each with its own amazing story and legacy. The most famous one is obviously Angkor Wat, the temple at the centre of the complex dedicated to Lord Vishnu and also the funerary temple to King Suryavaman II. Angkor Thom is the wider complex surrounding Angkor Wat, Bayon Temple is where the famous 4 faced Bodhisattvas reside, Ta Phrom is where Angelina Jolie traipsed through as Tomb Raider and the terrace of Elephants are where the King used to conduct gigantic military inspections and perform send-offs and royal receptions for the departing and arriving armies. You can easily find a tour guide at any hotel or tour agency in town and get the same story rubber stamped by the tourism authority. But if you’re looking for something different, get Youen Leak, a local temple tour guide who also does off the beaten track experiences on Backstreet Academy or try rolling into Angkor on a Vespa with Vespa Adventures Siem Reap! 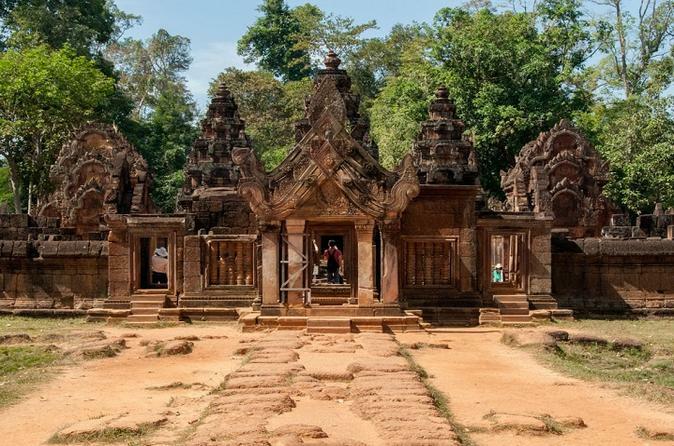 While Angkor Thom, the main Angkor Complex gets the majority of visitors, there are a couple of other temples that really deserve more recognition and conservation. Here are 3 of our top picks! Koh Ker was at its heyday once the capital of the Angkor empire, although just for a short 16 years. Lots of temple ruins remain here in various states of disrepair, but one temple still stands imposing – The Prasat Thom 7-tiered temple. It looks more like an Aztec stepped pyramid than most of the other temples, so makes for a refreshing change! There are much fewer tourists here too, as it is more than 80km and 2 hours away from Siem Reap Town. Banteay Srei was built interestingly by a Brahmin counselor to the King, and it is known as the citadel of the women. Fitted with pink sandstones and overwhelmingly depicting female subjects, no one is quite sure what this is used for. Located over an hour from the main town, it’s also not as popular and makes for a nice quiet side trip. Located nearby to the main Angkor complex, Ba phuon is a majestic 3 tiered temple built in honour of the Hindu God Shiva. Restoration attempts have been unsuccessful so far but it’s a beautiful crumbling site, as ironic as it seems. It is more accessible than the other 2 but less visited due to the state of disrepair. After visiting countless temples and marvelling at their intricate stone carvings, this stone carving workshop is the perfect experience as it will make you completely appreciate the work put in by thousands of artisans who built the Angkor temples! Try carving a beautiful candle holder with intricate carvings under the tutelage of an Angkor restoration carving master and it will make your Angkor trip so much more meaningful!